This week I have spent quite a bit of time delving through a treasure trove of Aurora Branch memorabilia—a provocative and random assortment of handwritten minutes, old Church record forms, and branch newsletters. (My mother sent me the papers several years ago, and I believe she obtained them in 1982 when the family cleaned my grandparents’ house after my grandmother died.) Now that the documents are organized, I plan to mine them for insights into the workings of the branch and share the findings with all of you. The assortment includes six receipts for rental of the Odd Fellows Hall in 1937 (April, May, July, October, November, and December), all carefully held together with a straight pin. 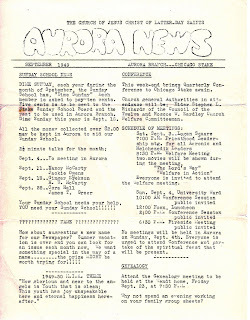 The collection includes several copies of newsletters and branch bulletins. This “Aurora News” might be the first issue because it asks readers to suggest a name. No suggestions were forthcoming, however, even with the promise of a prize. It remained the “Aurora News” through at least 1952. In 1957 it became the “Aurora Branch News” and was printed on blue paper. All this time Louise Erekson was the editor, reporter, and typist. She duplicated the newsletters on a mimeograph machine my parents owned. 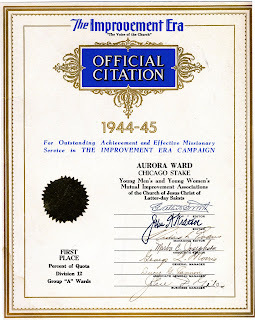 Aurora enjoyed its share of awards as this Official Citation attests. If you have branch directories or other historical documents relating to the Aurora Branch, please let me know. I would like to obtain photocopies or scans. I would use them to flesh out the history of the branch, and with your permission, I would like to share them online. I’m especially interested in obtaining a copy of Yours and Mine, the Aurora Branch Cookbook published in 1952. You can contact me by email at gingerhamer@yahoo.com. By the way, I officially subscribe to my grandmother’s motto: Don’t throw anything away!